Artist's conception of NASA's NPP satellite in orbit. NPP — short for National polar-orbiting operational environmental satellite system Preparatory Project — is the first satellite designed to collect data for both short-term weather forecasting and long-term climate monitoring. A new NASA satellite is poised to launch early Friday (Oct. 28) to continue the agency's string of Earth-watching missions, but the new spacecraft has a twist — it's the first probe ever built to track fast weather systems and long-term climate change, researchers say. The National polar-orbiting operational environmental satellite system Preparatory Project — or NPP for short — is slated to blast off from Vandenberg Air Force Base in California at 5:48 a.m. EDT (0948 GMT) Friday aboard a Delta 2 rocket. The $1.5 billion NPP spacecraft is the first satellite designed to collect data for both short-term weather forecasting and long-term climate monitoring, researchers said. It will also serve as a bridge to more advanced future satellite systems, which are expected to start studying our planet in five years or so. The NPP satellite is about the size of a minivan and weighs 4,500 pounds (2,041 kilograms). It will zip around Earth in a polar orbit, peering down at our planet from an altitude of 512 miles (824 kilometers). NPP will continue the sort of work done by venerable NASA Earth-observing satellites such as Terra, Aqua and Aura, researchers said. But NPP will provide a marked increase in capability, they added. "This is the time for the generational leap forward in operational weather forecasting observations," said Jim Gleason, NPP project scientist at NASA's Goddard Space Flight Center in Greenbelt, Md. NPP will use five different science instruments to scrutinize Earth, gathering a wide variety of data. For example, it will track atmospheric ozone and dust levels, record land and sea surface temperatures, monitor ice cover around the globe and measure changes in vegetation, among other things. In all, NPP will measure more than 30 different climate variables and will beam back to Earth 4 terabytes of data — the equivalent of 800 DVDs — every day, researchers said. The satellite's observations should be useful to weather forecasters all over the world, as well as scientists seeking a better understanding of long-term climate change and its impacts. 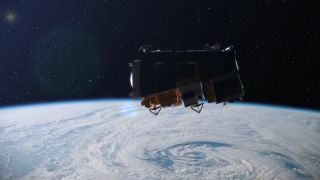 Researchers will also use the satellite to monitor natural disasters, such as hurricanes, wildfires, floods and volcanic eruptions. The NPP mission should provide "better observations for better predictions, to make better decisions," Gleason said. While NPP should give meteorologists and climate scientists a lot of data to pore over, the satellite was always envisioned as a stepping stone to even more capable future spacecraft. For example, NPP was originally proposed as a demonstration mission for the National Polar-orbiting Operational Environmental Satellite System (NPOESS), a joint military-civilian project. However, ballooning costs and a series of delays doomed NPOESS, and the program was canceled in 2010. The military-civilian partnership was dissolved, and each branch was told to develop its own line of Earth-observing satellites. NASA and the National Oceanic and Atmospheric Administration (NOAA) teamed up on the civilian program, which is called the Joint Polar Satellite System, or JPSS. NPP will help make JPSS a reality, researchers said. "NPP will lay the groundwork for the JPSS system, by proving out the capabilities and technologies of both the instruments and the ground system," Carson said. "NPP is a critical first step in creating a climate-capable operational system." NPP is designed to last for at least five years, so it should be able to deliver data until JPSS becomes operational. The first JPSS satellite is due to launch in late 2016, officials said.